On Monday, April 24, 2017, the Rotary Club of Cornwall Sunrise and the Rotary Club of Cornwall held their annual Paul Harris Dinner and Awards ceremony at which several individuals from Cornwall and area were recognized for their contributions to the community through community service and the support which they bring to the Rotary Clubs of the city. 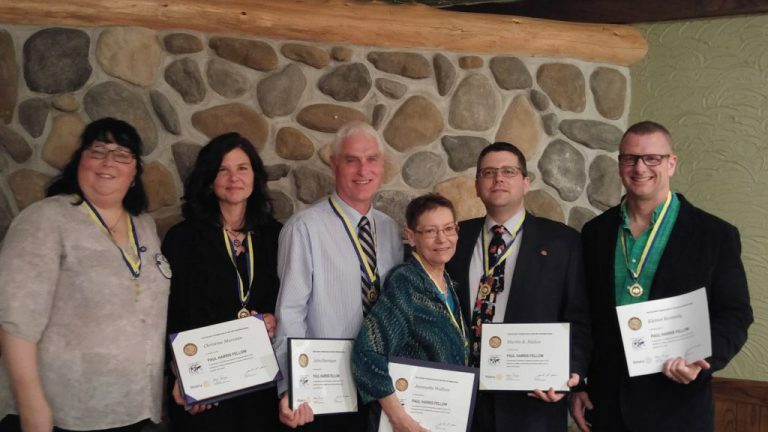 The Paul Harris Awards are presented annually by the local Rotary clubs in recognition of the contributions the honorees have made to Rotary and to their community – whether that community is local or international. The recipients of the Paul Harris Award have been generous with their time, their energy and their financial contributions and are deservin g of this prestigious recognition. Recipients of the Paul Harris Award 2017 from the Rotary Club of Cornwall Sunrise were Christine Marceau who has been extremely active in supporting a wide assortment of club activities and whose leadership, insight and wisdom are essential elements in the club. Martin Nadon was recognized for his leadership and dedication to the establishment of a thriving Rotaract Club at St. Lawrence College and has also contributed a great deal to the activities of the club. As a coach, John Flannigan has contributed greatly to the development of youth in Cornwall. Earlier this year, Emmanuel Agumah of Kumasi, Ghana, was recognized for his contributions and leadership in education and treatment of Buruli ulcer (a flesh-eating tropical disease) and other neglected tropical diseases. This year, the Rotary Club of Cornwall recognized Kieran Kennedy, principal of Long Sault Public School, for his years of dedication to education. Jennette Wallace has contributed countless hours in support of Rotary’s community and fundraising events. Manon Locke, a long-time member of the Club, has been especially active in her support club projects in the community as well as Rotary youth exchange.